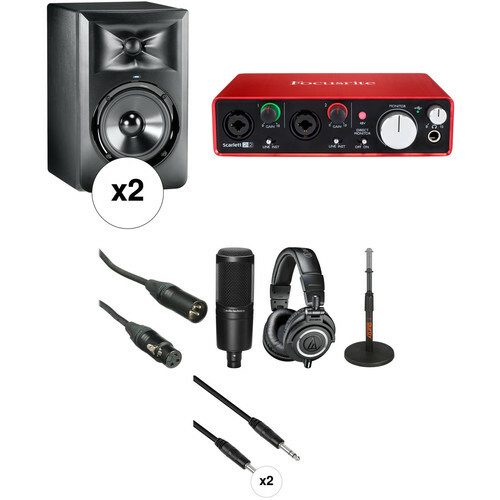 This B&H Kit combines a pair of JBL LSR305 5" Two-Way Powered Studio Monitors with an audio interface, microphone, headphones, one XLR cable, two 1/4" cables, and a desktop microphone stand to form the primary components of a recording setup for project studios, musicians, podcasts, and multimedia producers. The JBL LSR305 is a two-way bi-amplified reference monitor with a magnetically-shielded 5" low-frequency transducer and 1" soft-dome high-frequency transducer. The monitor features JBL's Image Control Waveguide technology for accurate audio reproduction and JBL's Slip Stream port design for improved bass response. The LSR305 is equipped with an LF trim switch and an HF trim switch, as well as dual 41W Class D amplifiers for both drivers. The audio interface is a 2-input, 2-output portable USB recording interface featuring two preamps, housed in an anodized-aluminum unibody chassis that is solid enough to take on the road. The preamps offer transparent, low-noise, and low-distortion performance with sufficient available headroom for using moving-coil, condenser, or ribbon microphones. A large monitor dial provides control over the output level being sent to monitor speakers, while a high-quality amplifier provides a clean yet loud signal to headphones. The cardioid condenser microphone is designed for vocal and general instrument capturing in project and professional studio environments. The capsule features a low-mass, side-address diaphragm with a cardioid polar pattern for rejecting ambiance and noise at the off-axis sections of the microphone capsule. A linear frequency response of 20 Hz to 20 kHz enables the flexibility to accurately reproduce signals from a wide variety of sources. The monitor headphones are designed for use in critical studio mixing and tracking as well as for DJ monitoring applications. They feature 45mm Neodymium drivers with copper-clad aluminum voice coils that provide an extended frequency response from 15 Hz to 28 kHz. The 6' XLR M to XLR F studio-quality microphone cable is for connecting a mic to mixers, preamps, audio interfaces and recorders, or to be used in any other application where XLR connectivity is required. The cable is engineered to be both quiet and durable, and is well-suited for critical recording and broadcast situations. The two 6' 1/4" TRS male to 1/4" TRS male interconnect cables feature Rean connectors with nickel-plated contacts on both ends, 24-gauge oxygen-free copper conductors, and spiral shielding to protect against EMI and RFI noise. The telescoping tabletop microphone stand meets the needs of any desktop audio applications that require the use of a microphone. It provides a solid, weighted round base with five non-slip rubber feet for additional stability. Professional Recording Kit with LSR305 Monitors, Audio Interface, Microphone, and Headphones is rated 5.0 out of 5 by 1. Rated 5 out of 5 by Brett from Amazing Value (and quality) As someone looking to get a good monitoring system wanting to ditch the headphones for professional video editing, I am very pleased. I've always loved JBL speakers in personal life and I find these do not disappoint at all. Great tonal range, and feel like incredible build quality. Really like that they have an option for a subwoofer down the road. Can't say enough good things about these speakers though, sound amazing. The USB interface is great, also doesn't require a AC outlet which helps with desk organization a bit. Very simple interface that seems to deliver great audio quality output and a handy set of inputs for home musician or two person podcasting on the go. Cabling seems to be of good quality, no issues whatsoever. Everything felt top notch to me. Headphones and microphone I have not tested but know friends that own both and swear by them so I won't hesitate to use them for voice recordings and podcasting with a few sound isolating accessories. speaking of, I would highly highly recommend the Auray sound isolation pads for the speakers. Made a night and day improvement on sound quality. Can not stress this enough as without them the surface they are on will emit all kinds of distortion and resonance frequencies. Once they are on the Auray pads, they immediately clean right up. The monitor JBL 5 , comes the pair ou separete ? Just one ?